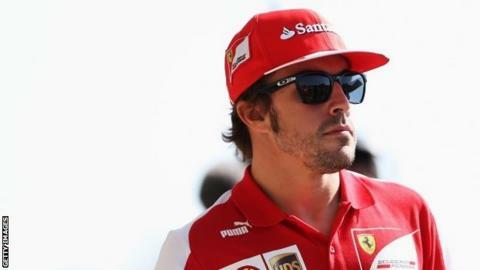 Ferrari's Fernando Alonso has been passed fit to race in this weekend's US Grand Prix by Formula 1 doctors. The Spaniard has been in back pain since bouncing across kerbs at 150mph during the last race in Abu Dhabi. The 32-year-old was checked over by doctors of governing body the FIA at the track in Austin, Texas on Thursday and given the all-clear to race. Alonso skipped his media commitments at the track and returned to his hotel in an attempt to aid his recovery. The double world champion was taken to hospital for precautionary checks after the incident in the race in Abu Dhabi on 3 November. He sustained an impact measured at 28G by the FIA medical sensors in his car when he ran off the track to avoid Toro Rosso's Jean-Eric Vergne. The Spaniard has said the week following the race was "difficult", with a lot of pain which gave him trouble sleeping. He has no specific injuries but has been taking anti-inflammatory pills to reduce his pain. Insiders say his back is improving day by day and Alonso wants to race. The first step is to see how his back feels when he drives in first practice on Friday morning. Ferrari development driver Pedro De La Rosa is on stand-by in case Alonso has any problems. Alonso is trying to secure second place in the drivers' and constructors' championships for himself and Ferrari. The 2005 and 2006 world champion is already almost certain to take second in the drivers' championship. With a maximum of 50 points still available, he is 34 points ahead of Lotus's Kimi Raikkonen, who is not taking part in the final two races, and 42 in front of Mercedes' Lewis Hamilton. But Ferrari are in a much tighter fight, in third place in the constructors' championship, 11 points behind Mercedes and 26 ahead of Lotus.